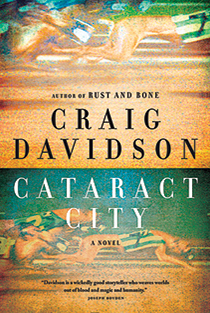 Cataract City was shortlisted for the 2013 Giller Prize. I was compelled to read the book after Paul Haggis’ passionate book intro at the Giller Gala. Of all the books I’ve read this year, this was my least favorite. Most of us in Cataract City were hard because the place built you that way. It asked you to follow a particular line and if you didn’t well, you went and lived someplace else. But if you stayed, you lived hard, and when you died you went into the ground that way: hard. Why tell us that Cataract City is hard? As a reader, you understand that through character and scene details. It struck me that my own fight had been a curtain jerker for a couple of mutts. If you’re looking for something to read, I’d suggest driving by Cataract City .